Here's the continuation of my story about what I went through last Sunday and Monday (Feb. 28, 2011). Warning.. this is a LONG STORY.. I just need to put it in writing for my reference. We arrived at Medical City, my SIL and I proceed immediately at the ULTRASOUND section. There's a line of patients getting an appointment so we waited for a while. I'm too thirsty at this time since I have not drink since 12 midnight. After a while, the receptionists handed me a form that I filled out and later on V paid for the procedure at the cashier. Later on, a nurse called me and led me to the Ultra sound room. I'm cold so I put on my socks. Still on my adult diaper hahaha. Just too afraid that laxative might still on effect, so to be sure I didn't remove it yet. The nurse did some procedures and I've been asking question about what organ is she testing. She left and told me that the doctor will come later on. I was left for few minutes in the room and after a while the doctor came and did the ultrasound asking me to be on my side. By the way, the ultrasound is for my pancreas, liver and kidney. I was done at 8: 30 am or so. My schedule for my endoscopy and colonoscopy was at 10 am so just imagine I still have to wait for that time. I'm SO THIRSTY and SO HUNGRY already!!! I have not eaten for 1 day already!! Violy and I proceeded to the endoscopy and colonoscopy section and again the nurse handed me some forms to fill out. We waited at the waiting room and at this time, I'm so cold and a bit nervous. Later on, a cute tall nurse called me and asked me to wear the hospital gown. Too bad we didn't have a cam that time (argghh. can't find the memory card), I should have taken a photo of myself with the hospital gown for the 1st time. I'm tooooooo cold that time so my hands are shaking and my veins are not visible. 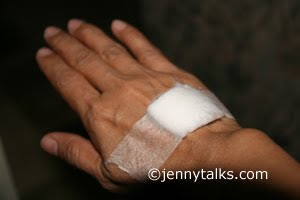 Anyway, the nurse put something on my right hand (forgot what it's called) and oh dear my blood flowed outside tsk tsk tsk.. The nurse led me to the endoscopy and colonoscopy room. The anesthesiologist was there and he asked some questions and explained what he's going to do. Later on, my doctor (wholl perform the procedures) finally came and asked me if I'm ready.. yay! My anesthesiologist sprayed anesthesia on my mouth and it became numbed after few minutes. I was given a sedative and I even said that my I'm getting dizzy. The last thing that I remembered was my lady doctor asked me where's the result of my ecg and fecalysis. The procedures started while I'm asleep. Of course I don;t know what happened that time as I'm sedated. ***Later on I was awake, I didn't even know I was at the recovery room already. A guy nurse asked me if I'm alright but I said no because I feel like going to poo. He said it's normal because of the effect of the procedure. Another doctor came and removed my oxygen and asked me if I'm ok. I was already awake but still groggy, I remember calling the nurse again asking him to look for my SIL to get my diaper just in case but she's not at the waiting room. I was getting better and later on the guy nurse gave me some prescriptions and papers given by my doctor and accompanied me to the waiting room where I met my SIL who's been waiting for me. I looked at the clock at it was almost 11:00 am. I figured that the 2 procedures where done quite fast and I recovered fast as well. THANKS GOD! We went to my doctor's office where she told me what happened at the procedures. She also told me her prognosis and it turned out that I have some minor "antral erosion" on my stomach and it's nothing really major. Finally felt relieved knowing that I don't have tumor or cancer! She prescribed a medicine that i'll drink for 2 weeks. She also advised me to eat on time, eat slowly, change my drinking water source and if I can stop drinking coffee or tea for the meantime. Yey, finally I already drink water but before going home my stomach started to growl so went to the CR. Wore another adult diaper just in case ..lol. Rode taxi and head home. Drunk my medicine and waited for SIL for our lunch. Finally I had something to eat. Just ate noodles from Chowking, didn't want to overload my stomach yet so I didn't so much. Took some rest..... Thank God, it's over! Thanks to SIL for accompanying and waiting for me.! Anyway, I just like to know how much yong endoscopy? I've been having stomach pain too since last year and my doctor advice me to undergo endoscopy. But natakot ako sa procedure so I asked kung may ibang way pa ba para malaman kung bakit sumasakit tummy ko. he adviced to get ultrasound of liver, GB & pancreas saka urine & stools exam. and everything is normal naman. Now he is asking me if I would like to resume on getting one, in two weeks but I forgot to ask how much it would cost me. That's why I am asking, saka para maprepare ko na rin. Hehe.